At Gibson's Bakery, we create freshly made cakes, pies and savoury pastries every day. We offer freshly made, local (Kent) breads and are proud to offer Wilmhurst bakery products (produced just a mile away in Wingham, Kent). E.T. 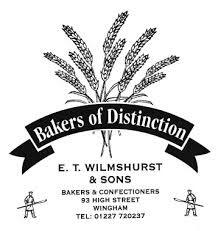 Wilmshurst and Sons was started in 1931 by Edward Thomas Wilmshurst in a small village called Westmarsh near Ash in Kent. In 1951 he purchased the business in Wingham which he ran side by side with the business in Westmarsh. He also bought another business in Wingham from Mr Gower but only for his door to door delivery round. His two sons Brian and Terry joined with him in running the business during the late 50`s. Edward eventually retired in 1972 selling the business at Westmarsh and leaving the running of the Wingham Shop to Brian and Terry. In the early days most of the business was from door-to-door sales but during the 70`s this gradually reduced and the business went over to be more wholesale oriented. Terry retired in 2000 and gradually Brian has taken a back seat only coming into work when needed. The business is now run by Edward's grandson Richard, who after attending the National Bakery School in London, went to work for various bakeries in the local area and also a stint in a traditional French bakery. The business still has its shop in Wingham and continues to serve wholesale customers in the surrounding area from small village shops to supermarkets. Thanks to our many years of experience, we have built up an enviable reputation around the area as we have always strived to be known as one of the best bakeries in East Kent. People travel from all around the area to our shop here in Wingham, to try our delicious baked goods, many of whom return to us over and over again, such is the amazing quality of food that we make and our friendly customer service. With a passion for local produce and good ingredients, we have developed a range of traditional premium cookies which are hand baked in small batches. The Captain’s Kentish Apple and Hazelnut cookies, are made with locally sourced Kentish Bramley apples, which are 'air dried' by us and hand roasted hazelnuts. Our sweet cookies are so oaty and chewy As well as Kentish Apple & Hazelnut, we produce a variety of different flavours such as a Great Taste Award winning Gluten Free cookie, Oat & Honey, Goji Berry & White Chocolate, Pecan & Maple Syrup and Oat and Raisin. Occasionally, we also bake special edition cookies, for example, The Captain's Christmas Cookies are made using dark chocolate, cranberries and seasonal spices.